The supreme leader of the Indigenous People of Biafra (IPOB) worldwide, Who is also an imperial citizen of Britain - Mazi Nnamdi Kanu, has along with his aged parents, been in secretive custody (detention) of the Nigerian army since 14th September, 2017. This was the date their residence was murderously invaded by a detachment of the Nigerian military at Afara-ukwu, Ibeku in Umuahia, Abia State, and whisked away on the orders of President Muhammadu Buhari. British citizens of good conscience scattered all over the world, should therefore as a matter of urgency, place a serious protest demand for the release of their fellow citizen, Mazi Nnamdi Kanu who has been in unlawful captivity of the Nigerian army. The citizens of Britain, it is expected, should mount enormous pressure on the British Government led by Prime Minister (Rt. Hon.) Theresa May and Her Royal Majesty, Queen Elizabeth II of England through the House of Commons and House of Lords. This will exert the much needed diplomatic pressure on the Nigerian government to accord due respect to the principles of human rights of an imperial British citizen even Mazi Nnamdi Kanu and get him unconditionally released from detention for almost one year running now. From the foregoing, it is obviously noted that the British government is cynical about the plight of their own citizen who has extra-judicially been under incarceration in the hands of the Nigerian army since the 14th of September 2017. British citizens should therefore note that any untoward treatment meted on a British citizen by any government anywhere, is an indirect affront to all Britons no matter the location. Mazi Nnamdi Kanu's unlawful detention by the Nigerian government is indisputably a mockery against civility and decency which the people and government of the United Kingdom represent. To some British citizens who may not have known the person of Mazi Nnamdi Kanu, here is his his description. He is a British citizen, highly enlightened and educated in Britain. He is a Biafran by indigenous identification, from the West African sub-region. He is an Igbo by tribe. Mazi Nnamdi Kanu is the supreme, courageous and indefatigable leader of the Indigenous People of Biafra (IPOB) globally, the Director of Radio Biafra London and Biafra Television respectively. He was arrested by the Nigerian government for freely and rightly agitating for the independence of Biafra his homeland, from the Nigerian defunct federation. He suffered unlawful detention without trial for eighteen (18) good Calendar months (14th October 2015 to 28th April 2017), with his release eventually effected on very stringent bail conditions as granted by Justice (Mrs.) Binta Nyako of the Nigerian Federal High Court, Abuja. Before his arrest in the year 2015, he resided in his British home at Northwest part of London, England. It was from there he traveled out to Nigeria for a visit to his parents and other relatives, and was then picked touching down in Lagos, by the Nigerian Security Operatives. He remained obedient to the stipulated bail conditions as handed down to him by the Court. It was during this bail period that the Nigerian military orchestrated the most barbaric and murderous invasion of his residence at Afara-ukwu, Ibeku in Umuahia, Abia State, Biafraland, presently under the occupation of the Nigerian government. Almost a month to his next court appearance scheduled for the 17th of October 2017, the Nigerian army in concert with presidential directives from Abuja, carried out vampiric exercise tagged "Operation Python Dance II" in his compound which took place on the 14th of September 2017, with 28 Biafrans massacred, including the Palace cook and a security dog. 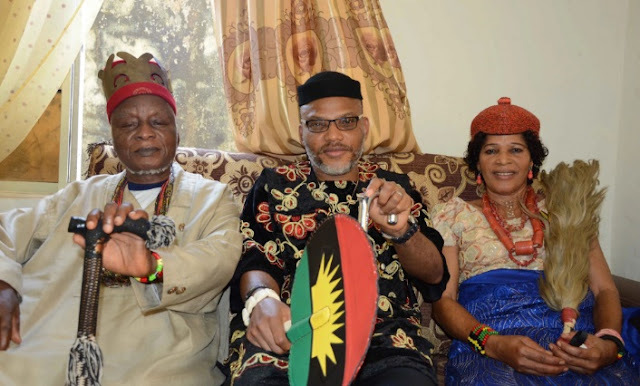 It was during this commando-styled invasion of the palace residence of an armless and non-violent personality, that he was abducted along with his father who equally is His Royal Majesty (HRM), Eze Israel Okwu-Kanu (Egwu Ukwu II), the traditional ruler of Afara-ukwu, Ibeku and his mother, Ugoeze Sally Kanu. They have been kept incommunicado in a mysterious detention site till date. Based on this chain of gross human rights violations carried out against a British citizen of the caliber of Mazi Nnamdi Kanu, that the attention of other crystal-minded British citizens the world over, should expeditiously under the enjoyable privileges and protections of imperial Britons, as contained in the articles of Vienna Convention, should pressure for the immediate release of their fellow citizen. The inept watchful eyes of the British government since the plights of their Kanu, is to say the least, most callously disappointing and inhuman. The Nigerian government has brazenly trampled upon the rights of this man with contempt and must not be allowed to continue. Article 36 of Vienna Convention pointedly stated that any British citizen arrested anywhere in the world should be entitled to consular services of the British High Commission situated in the area and that a British government representative must always attend the trial of such an arrested citizen until justice is finally dispensed. The responsibility of the consular services ensures that fair and unbiased trial is duly given to the British citizen. With this consular administrative oversight, the trial of such a citizen is not expected to last longer than necessary neither would the detention be elongated. It is unfortunate to state here however, that the case of Mazi Nnamdi Kanu in the hands of the Nigerian government since 14th September 2017, when he was abducted by the Nigerian army, grievously runs foul of the above stipulated Vienna provisions. Mazi Nnamdi Kanu up till date, has neither been seen, heard of nor arraigned in court whether within or outside Nigeria for any perceived crime. He has been kept incommunicado eversince without any access to medication. Yet the drivers of the government of the United Kingdom have remained indifferent. Although the British High Commission in Abuja was said to have written to Nigerian authorities demanding the whereabouts of Mazi Nnamdi Kanu after that bizarre raid in his residence. But such a move is not good enough to enforce and deliver the privileges and protections as contained in the Vienna Convention Article for British citizens of which Mazi Nnamdi Kanu is one. British citizens must protest this unlawful detention of their fellow which has been plighted for close to 12 calendar months now in the hands of the Nigerian government. They must not wink at the cynicism of their home government with regards to the violation of the rights of Mazi Nnamdi Kanu. The silence over the sufferings of this Biafran leader in the hands of his captors should not be discountenanced as no one can foretell whose turn it could be tomorrow. Another British citizen could go through such levels of dehumanization in the hands of the Pakistani or Iranian governments and yet the British government will remain docile and inept at the protection of such an individual. The citizens of Britain must initiate and embark on immediate protests, unmistakably demanding that their government should compel the Nigerian government to respect international laws of human rights protection and release their fellow British citizen, Mazi Nnamdi Kanu immediately and unconditionally. His persecution remains unjustifiable and can no longer be tolerated.